Go to the Gilbert Munger Web site home page. The Historical Society has a wonderful 19th Century landscape painted by Gilbert Munger [1837-1903], who lived and painted in Duluth during several periods of his life. This painting was probably done in Duluth, since its 1872 date matches a period when Munger was a resident. However, one look convinces us that the scene is not in Minnesota. A hint to the subject is the inscription "Donna Lake" on the back, apparently in Munger's hand. Where is Donna Lake and why did Munger paint it? I have spent some time tracking down the answers. They tell us something of Munger's adventures further West. Donna Lake (Lake Marian) by Gilbert Munger. Oil on canvas, 18" x 30", 1872. St. Louis Co. Historical Society Collection. Munger's best paintings rival those by more famous contemporaries like Albert Bierstadt, William Keith, and Thomas Hill. But Munger's life and work have not been studied much. Munger was born in Connecticut and went to Washington DC at age 13 to learn natural history and landscape engraving. Here he taught himself to paint on frequent walks to the woods. During the Civil War he was a construction engineer in the Union Army. In 1866 he moved to New York City, where he had some success as an artist. A year later he relocated to Duluth to join his brother Roger, who settled there permanently. During this first stay in Minnesota Gilbert worked on a large painting of Minnehaha Falls that received favorable reviews from newspaper art critics. At this time Munger also painted a view of Northern California's Mt. Shasta, dated 1867, that is now at the Tweed Art Museum in Duluth. This painting is a bit of a puzzle, because as far as anyone can tell he had never been west of Minnesota at that time. Alfred Harrison of North Point Gallery in San Francisco, an expert on early Western landscape painters, speculates that Munger painted Mt. Shasta either from a photograph or from a painting by the early California landscape painter Frederick Butman. This case is a warning to the amateur art sleuth (me) that things are not always what they seem. In 1869 Munger joined the US. Government's Geological Exploration of the 40th Parallel as a guest artist. That summer he traveled and painted with a survey team in the Wasatch and Uinta Mountains of Utah, ending up in San Francisco in November. We are fortunate that Munger joined this enterprise, for it was headed by Clarence King, one of the most famous scientists and explorers of his day, who went on to become the head of the US Geological Survey in Washington DC. The 40th Parallel work was carefully documented in government records and King's life has been researched by many historians. We may not be able to discover much about Munger directly from historical records, but we can track him through King's activities during this period. Munger became good friends with King. They hung out together in San Francisco during the first part of 1870, where Munger got good reviews from the local press for his paintings. Munger accompanied the next portion of the expedition that Fall on which King inspected the glaciers of Mt. Shasta. While Munger did climb the mountain, he apparently spent most of his time painting at the base. He went on without King to paint Mt. Hood in Oregon and then returned to San Francisco. At the end of 1870 Munger returned east to New York City, finally arriving back in Duluth in the summer of 1871. By mid 1872 (we must assume that our painting is finished by now) the West called again and Munger left for a painting trip to California, Idaho, Oregon, and Washington. He arrived back in Duluth early in 1874. By 1877 Munger had departed for Europe and did not return to America until 1893. His last years were spent in Duluth and Washington DC. It seemed a good bet that Donna Lake was associated with the King expeditions. The results were published in the 1870s as a seven volume set. Volume 1, one of the last to be published, in 1878, is Clarence King's monumental work Systematic Geology. In the list of illustrations we find that the ten chromolithographs are "after studies by Gilbert Munger". Unfortunately, the copy in which I first discovered this fact was missing most of these color plates. 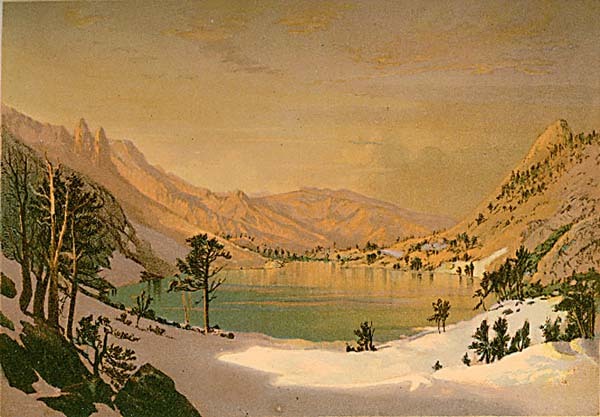 In a complete copy I found later, however, I saw that Plate II: Lake Marian Humboldt Range Nevada, reproduced here, obviously depicts the same lake as our painting. from Systematic Geology by Clarence King, 1878. From the expedition records it was now straightforward to discover that Clarence King found this lake in the summer of 1868, a year before Munger joined him. King was so taken with the lake that he named it after his little sister Marian. As a Christmas present to her in 1870 he published a book, printed in an edition of three, containing an account of the discovery of the lake, photographs of the site, and a poem he wrote about the lake. (King was a better explorer and geologist than poet.) Two other lakes, in Utah, received similar treatment in honor of Marian's girl friends Jan and Lall. So the Donna Lake painting depicts King's Lake Marian, which is somewhere in Nevada. Expedition records and other documents, however, fail to place Munger at the lake. King discovered it before Munger joined him and no records have King or Munger back there later. The best clue we have is a sentence in the diary of compatriot Samuel Franklin Emmons, who mentions a Munger sketch of Lake Marian in the entry for August 19, 1870. And we still have the problems of finding the location of the actual lake and learning why Munger called it Donna Lake. In the first half of 1871 Munger showed a painting titled "Lake Marian," listed as owned by Clarence King, at exhibitions in New York, New Haven, and Boston. This must be a different depiction of the subject, however, since the date is too early for it to be our 1872 painting. The exhibition painting may be an undated 11" x 22" canvas, showing almost the same prospect, that appeared on the art market in 1993. Our 1872 painting, which measures 18" x 30", may have been done based on this smaller one (and that one from an expedition photograph). There are other similar pairs of Munger paintings of Western scenes. In each pair one is an 11" x 22" study and the other a larger studio painting. The subjects are Mt. Hood in Oregon, Lake Lall in Utah, and the Wasatch Range in Utah. Lake Marian by Gilbert Munger. Oil on canvas, 11" x 22", ca. 1870. Someone else solved the problem of the location of Lake Marian for me. In the June, 1939 issue of the Sierra Club Bulletin, Francis Farquhar published an article on his efforts to locate Lakes Marian, Jan, and Lall. His interest arose from seeing a copy of King's Christmas book, which is reprinted in the article. 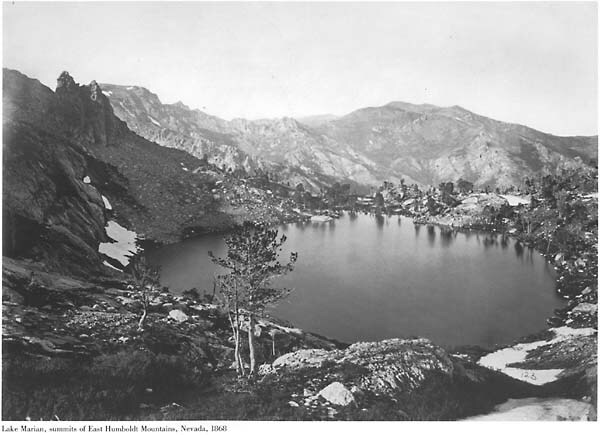 Following clues in the book and information from the expedition records, Farquhar located Lake Marian in the Ruby Mountains of Nevada, about 30 miles southeast of Elko. He journeyed there and took photographs that show conclusively he had the right lake. The article juxtaposes his photographs with those from the King expedition and they match exactly. In the years between 1868 and 1939, however, Lake Marian had reverted to its original name of "Overland Lake", by which it is still known. Apparently King appropriated an already-named lake for his sister. 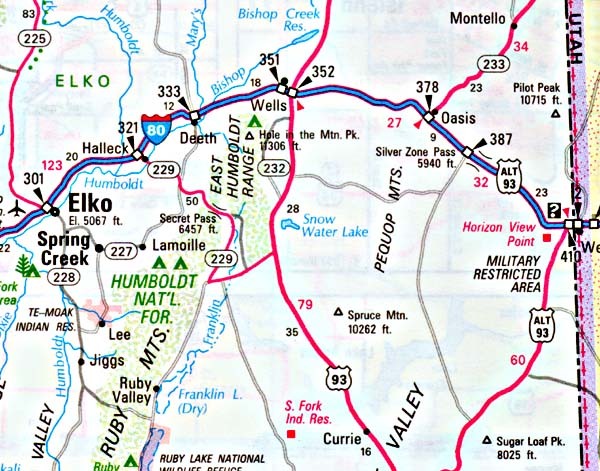 "RUBY MTS" at the lower left of the map. This brings us back to the "Donna Lake" inscription on the 1872 painting. Here I am still stumped. Historians of the area assure me that there has never been a Donna Lake in Northeastern Nevada. A possible explanation is that Munger mislabeled the painting. 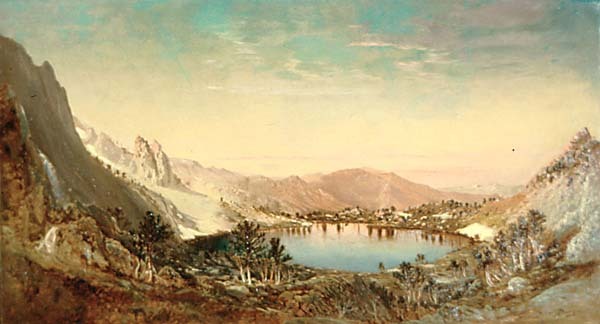 He did visit and paint the famous Donner Lake in California and it bears a resemblance to Lake Marian. Another explanation is that someone else wrote the label and got it wrong. Michael D. Schroeder is an art historian who has been constructing a chronology of Gilbert Munger's activities in America and building a database of the existing paintings, available on the web at http://GilbertMunger.org. He would like to hear about any paintings he has overlooked. His other job is doing computer research for Microsoft.